Here we are, just weeks left in 2014. If you’re like me, you’re scratching your head and wondering how time went so quickly. The New Year brings a chance to make a fresh start and improve our lives. 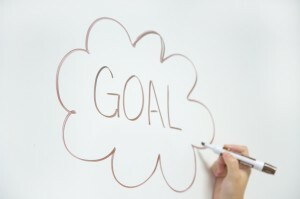 One of the best ways to do that is to set realistic goals. In fact, one of my favorite things to do at the end of December each year is to set financial goals for the new year. I’m convinced that I’ve had such good luck achieving many of my financial goals because I write them down and keep myself accountable. The most important step is to create realistic goals. If you make $50,000 and your goal is to save $25,000 this year, I’m here to tell you, this isn’t likely to happen. If you set unachievable goals, you’ll likely give up early. When you give up, you’ll likely achieve much less financially in 2015. Instead, set modest goals that will improve your financial standing and are achievable. If you make $50,000, maybe, depending on your situation, saving $2,400, or $200 a month is within your reach. The first year you set financial goals, you want to build your confidence and realize that you can set goals and achieve them. The second year, you can be more ambitious with your goals. In addition to setting realistic financial goals, you’ll likely also bolster your success if you find a way to remain accountable. I blog, so I always share my financial goals on my blog. Sometimes I procrastinate, but when I realize it’s almost time to update my financial goals on the blog, I suddenly become a lot more motivated. I find that accountability is largely the reason that I’m successful with my financial goals. If you don’t blog, you can still find ways to be accountable. You can share your financial goals with a friend or family member and keep them posted on how you’re doing. Some people choose to go public and share big by sharing on their Facebook page. A year’s worth of financial goals staring at you on January 1st can be daunting. To make your goals more manageable, break them down. For instance, you could break your financial goals down by month or quarter. If you want to save $2,400, put aside $200 a month or $600 a quarter. If you’ve saved $600 by the end of March, you can still feel like you’re a long way from your goal for the year. You can motivate yourself by creating a way to track your progress visually. Create a vertical bar marked by four lines. Each line represents one quarter’s saving goal. Then, each quarter, mark your progress. Or, as you put money in your savings account, color in the bar graph so you can see your progress, slow and steady. I always find it amazing how much I am able to achieve financially each year. When you create your financial goals, make sure to track where you are currently. How much do you have in savings? How much do you have in retirement? How much in investments? How much debt do you have? What is your net worth? Then, at the end of December, compare where you were last December to where you are this December. You’ll likely be amazed how far you’ve come financially just by setting manageable goals, making yourself accountable, and keeping track of your progress. Do you make financial resolutions every year? If so, what helps you achieve your goals?